Design Burd Inc.Promoting Academic Excellence! 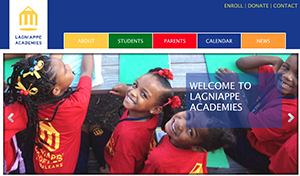 | Design Burd Inc.
We are thrilled to design, maintain, and hosts Lagniappe Academies. We created a colorful customized wordpress theme that would catch the eye of not only parents and teachers, but also the young students. Throughout the site you will see an easy-to-use calendar tool created by our developers, showcasing all student events and important dates. We've also made a student login for everyone to stay connected with their own account as well as a customized photo gallery.